I’m such a home bird so the thought of going away for Christmas is pretty alien to me. I spend every year with all my family, indulging in lots of food and drinking lots of alcohol! Christmas is definitely one of my favourite times of year and I love our little family traditions. However, I do see all of the Christmas/holiday photos abroad and think it looks incredible. Maybe one day I will do something slightly different! New York is just a dreamy destination full stop. I fell in love with the city when I visited in 2016 and I would go back every year if I could. Even in November, New York is magical as all the department stores on Fifth Ave have the prettiest Christmas decorations, wreaths and lights up. However, there’s something about the build up to Christmas in December (and around Christmas itself) that just adds to it. 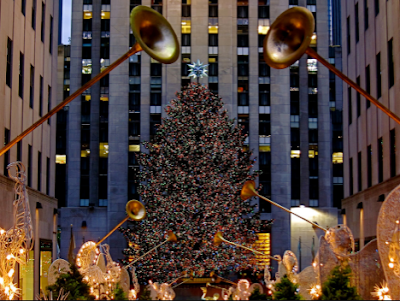 I have always wanted to see the Rockerfeller tree lit up and to ice skate at the Rockerfeller Centre. I think this is featured in pretty much every Christmas film set in New York so it’s been a dream of mine since I was a little girl. 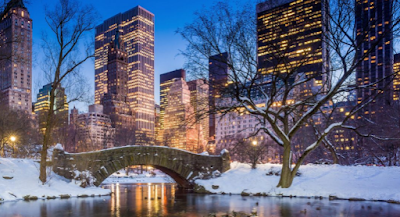 Ideally I’d love a white Christmas- to visit Central Park in the snow would be amazing too. Definitely gives me Elf vibes- although I wouldn’t be able to throw snowballs as quick as him, that’s for sure! Bryant Park also hosts a winter village with mini Christmas market stalls and food. I found this area amazing when I visited in November so I can imagine it would really come to life in December!! New York is a city I hope to visit many times in my life but a visit during the Christmas period is high on my list. 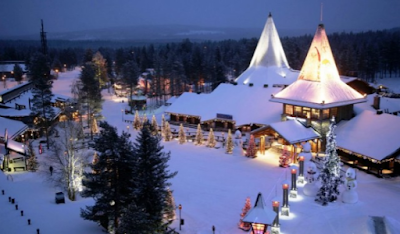 Next up, Lapland. Located in Norway, you can pretty much always guarantee a white Christmas here. Snow makes me feel so Christmassy- I wish it snowed every Christmas but snow can be so inconvenient when you actually have plans at home! This is the stereotypical 'traditional' idea of Christmas; Santa, reindeers and a lot of snow! Although it would be the perfect break for a family with children, I can't deny that I'd go here this year without any children given the chance! 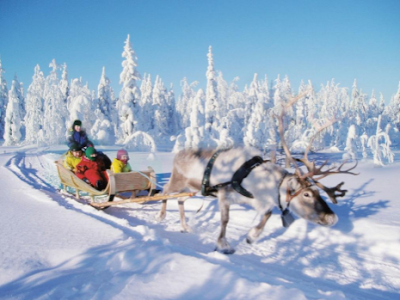 Get involved with local activities such as husky sledging or, if you’re wanting a real Christmas experience, opt for an exclusive reindeer tour. This looks pretty magical to me and is definitely something on my list to do before I get too old! You can also sometimes see the Northern Lights from Lapland which would definitely be the icing on the cake of an amazing trip. 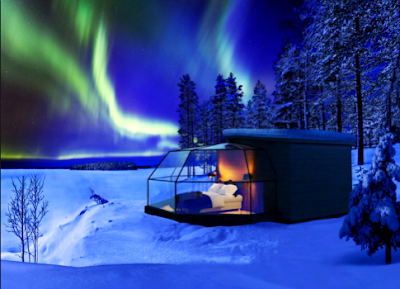 Choose to stay in a glass igloo overnight for an added festive touch. 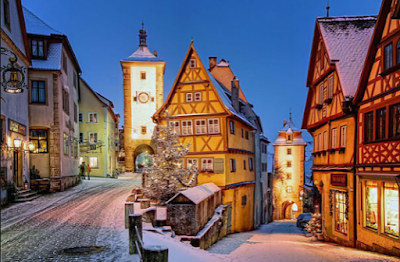 Rothenburg ob der Tauber, a quaint little town in the south of Germany. The old fashioned, thatched buildings and cobbled streets have such a cute feel and I am obsessed! This town looks even better at Christmas. The main square is lit up full of Christmas lights and is filled with market stalls. 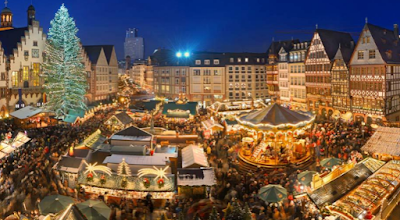 I’ve always wanted to visit a ‘proper’ German market to see how they are in the country that they originate from! Plus to try some traditional German food. Where better than Germany itself to experience this?! There is also a Christmas museum which is open all year but is a must see in December. You can buy your very own Christmas decorations here too! I just love the look of this city and it is somewhere on my list for the near future. Italy is one of my favourite countries in the world. Being part Italian, Italy holds a lot of sentimental value for me. However I also love it by nature: the food, the culture, the language. 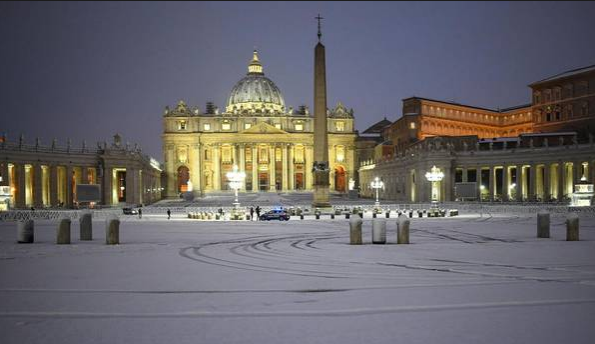 It is a beautiful country and Rome is equally as stunning. Growing up in a religious family, I’ve attended church since being young. I visited Rome in September and the Vatican was one of the first things on my list to see. I'd heard so much about it but never experienced it for myself and it was incredible. More than anything, the decor inside the Vatican is out of this world and blew me away. I personally find that I feel very peaceful when visiting a church, particularly a foreign church. I always love to have a look round and light a candle for my loved ones. Of course, I had to visit St Peter's Basilica during my visit to Rome. 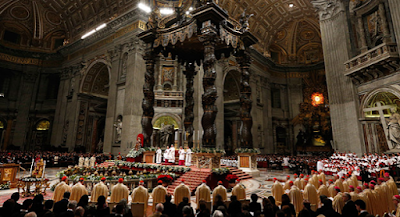 At Christmas, the Pope holds a midnight mass for members of the public. I've attended mass in Italy before which was beautiful and was hosted by a fairly high up priest, however, I think hearing mass said by the Pope would be quite an overwhelming and surreal experience- for me at least. Held in the beautiful St Peters Basilica, I imagine it to be breathtaking. This is definitely a once in a lifetime experience! Paris. One of the most amazing cities I have visited. I've had the pleasure of visiting Paris twice now and I definitely will be returning multiple times in the future. There's such a romantic feel to the city and the buildings are so beautiful. I didn't think Paris could get much better but I feel like a visit at Christmas may well add to the charm. 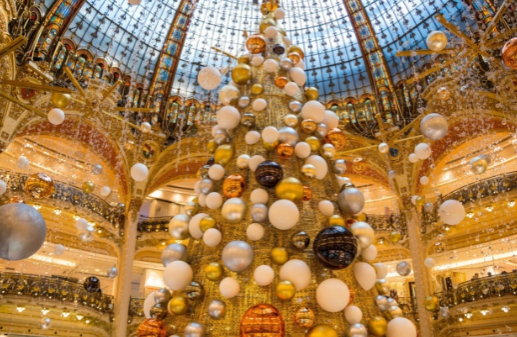 There's so much to do in Paris in December. There's not one but 8 Christmas markets to visit, including a beautiful one located in the beautiful area of Monmatre. 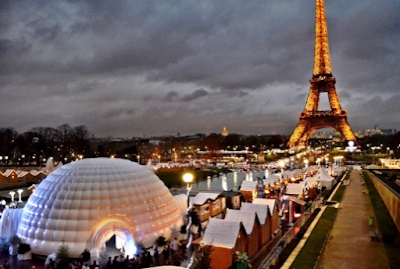 The main markets can be found at the bottom of the Champs-Élysées where guests can also ice skate on the large rink. 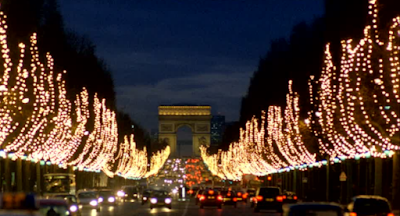 There are supposedly 150,000 lights along the Champs-Élysées at Christmas time so this is definitely something to take in. The department stores are also filled with perfectly decorated trees and Christmas lights to add a festive feel to the shopping experience. In addition to the specially added Christmas activities, there are of course the usual sights too. Opt to climb the Eiffel Tower and take in the views, visit the Louvre, relax on a cruise down the River Seine or enjoy the French cuisine at a local cafe or restaurant. The choices are endless. I can't wait to visit Paris again and next time it will definitely be in December! There you have my 5 dream Christmas destinations. I hope that someday, I will have had the opportunity to visit all 5 of these incredible destinations and have the best memories to share.